The 2nd of June, during her 3 day visit to Norway, queen Beatrix of the Netherlands held a reception in Oslo for Dutch people living in Norway. Herbert and I were amongst the 300 Dutch people that were invited. Since my parents were visiting and said they could babysit, we decided to go to Oslo for 2 days! We took the train to Oslo the 1st of June, had a 1 night stay in a nice hotel and after the reception we took the night train back to Sandnes. 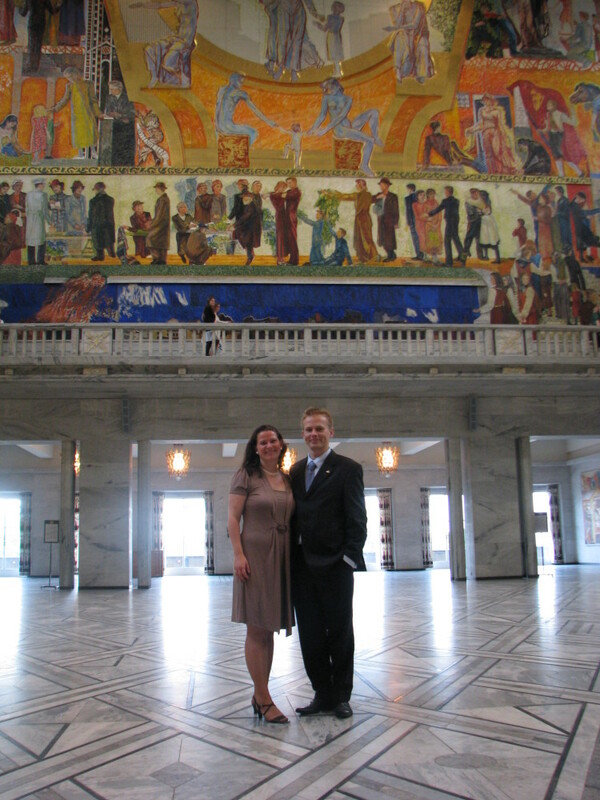 Pictures from our trip to Oslo and back in another blog, this one is just about the queen. The dresscode was in Dutch, and for the men it was “donker pak” which is a dark suit (sounds easy enough) and for the ladies it was “middagjapon” which I would translate to afternoon dress. Now….. WHAT is an afternoon dress. We asked the Dutch Embassy and got the answer that it’s a dress with sleeves (no naked shoulders) and not long, but below the knees. Ok, off shopping, which I soon found out was easier said then done! I first went to the nearest shopping mall, 4 shops with ladies clothes, nothing! After that, off the the biggest shopping mall in the area with MANY clothing shops. Found 1 black dress which was OK, but far from perfect. But hey.. at least I had a dress that looked decent and even was cheap. I had my mom and daughter with me and mom wanted to go back to one of the shops where she’d seen a shirt she liked. Since we’d been in every shop around I was quite exhausted and sat back in a chair while mom was looking around a bit more. After 10 minutes of waiting Marthe got a bit tired of just sitting and waiting for grandma, so she started to look through some clothes right next to the chair I was sitting in. Then she suddenly pulled out something and said: “mom, isn’t this a nice dress for you?” And…. YES IT WAS! They only had 2 sizes of that dress, but I actually fitted one of them perfectly, so even though I had already bought the other black dress, I still bought this one as well, since I thought it was really nice and fit quite perfectly to the ‘afternoon dress’ description!! Just before the reception, all dutchies got together and we met and talked with Kees Verkerk a bit, a famous Dutch ice skater. He lives in Norway and owns a camping site in the south. Kees is a really nice old (sorry.. elderly! hehe, hope he doesn’t read this) man. I’d heard a lot about him, but I am too young to remember his skating top years. After a while we all got to go up the stairs to a room where her majesty queen Beatrix was waiting to greet us all. We all had a card which said who we were and what we do. We had to give this card to a guy at the room who then read this to the queen before we shook her hand (not that she will remember all this I guess, but well… decorum!). Before entering the room I thought about what to say to her, something like “welcome to Norway and thank you for inviting me here, it is really nice to meet you!” But… everything went just soooo fast. I followed my husband just after this guy at the door had introduced us, shook her hand, smiled and THINK I said “hello”, but I’m actually not sure.. hehe. And off we went to the next room. When standing in the next room, we found out that most people had the same feeling of “wow, what happened just there… that was really fast!” But, Herbert and I were 2 of the few (about 20 out of those 300) fortunate people that got to have a longer chat with her afterwards. Herbert was the chairman of the Dutch club here in Stavanger area, which was the reason he got to talk to her majesty about that, together with the chairmen of the Dutch clubs in Oslo and Bergen, the head master of a Dutch school and a lady that visits Dutch people in prison here in Norway. When everybody had been shaking hands with the queen, she came into the room we were in and was introduced to us again. Only the names were said, but after hearing Herberts name she pointed at him and said: “Stavanger, right? Dutch club Stavanger?” Impressive, how much can one person remember! Everybody had to send in a little note a few weeks before, writing something about themselves, so she could read it to prepare what she could talk about with those people at the tables. After talking to the chairman of the club in Bergen, she turned to Herbert again and asked: “are you new in Norway? just immigrated?” Herberts response being: “no, we’ve lived here for 15 years!” she answered: “what? 15 years? you must be born here then!” (followed by a smile). I know I know… my hubby looks like a teenager! We didn’t get to ask her any questions, we could just answer her questions to us. I didn’t chat with her, but it was very nice just standing there (just across the little round table from her less than a metre away from her) listening to the discussion between her and the others about Dutchmen in Norway. It was a bit ‘strange’ to stand there so close to her, yet… almost like its an everyday thing chatting with her. She seemed really interested and well-informed about the clubs and people here.